Mapex Storm 5 piece kit includes 22in x 18in bass drum, 10in x 7in & 12in x 8in rack toms, 16in x 14in floor and a 14in x 5in matching wood snare. Storm Drums: The Storm Series sets offer shallow depth toms 100% Poplar shells complete with the new SONIClear™ Bearing Edge, which increases the contact between the drumhead and shell and allows the head to sit flat on the edge. The SONIClear™ bearing edge produces a stronger and more centered pitch and makes the drums remarkably easy to tune. “The SONIClear™ bearing edge has been very important to the success of all the Mapex high quality sets like Saturn V, Armory and Mars, basically helping players at all levels get a bigger and better sound quicker, states Gary Ingraffia , Mapex Brand Mnager. “That frustration, especially for players who are learning the art of tuning their drums, can lead to a lack of enjoyment and less time playing. The SONIClear™ Bearing Edge solves those issues and enables players to get a great sound even without much tuning experience. This is a truly a significant advantage found on all Storm sets. A wide selection of cutting edge finishes along with hardware options in chrome and black plated make The Storm series the place to begin. Storm Hardware: The new Storm hardware series included with all Storm kits. The double-braced Storm cymbal stands are 3 tier for maximum adjustment and cymbal placement. 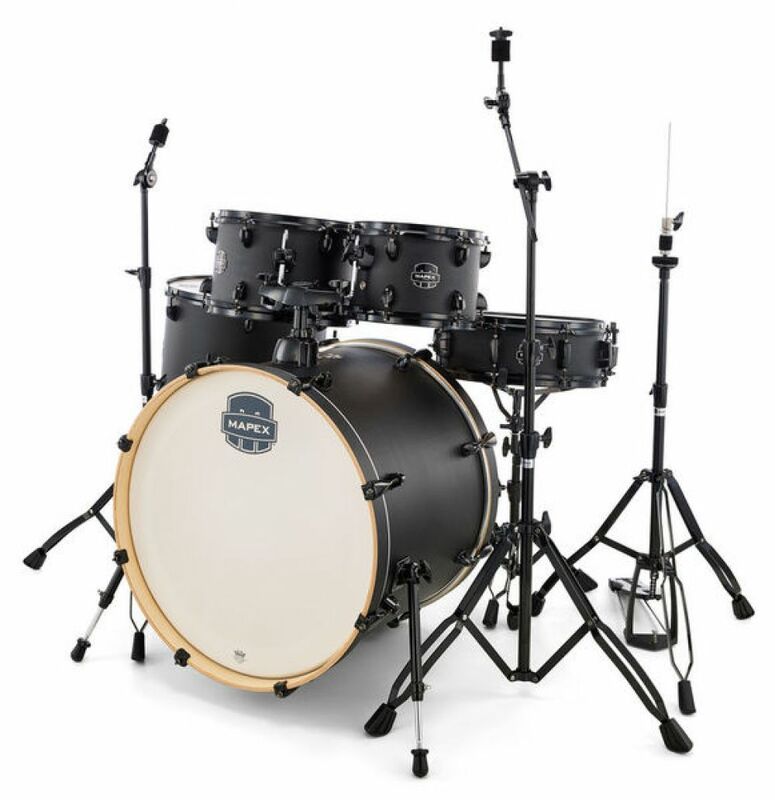 All Storm hardware feature the new Mapex concave leg design for easier better positioning. This all-purpose hardware is available as individual pieces, and comes in a choice of chrome and a special Black plated finish and will endure years of constant playing and abuse. Cymbals not included. Never before has a drum and hardware series offered so much in the way of sound, ease of tuning and overall cutting edge looks. A wide selection of finishes and cutting edge configurations are available.